The typical stone built house Casa Fontana is located at the edge of the small village Isolalunga (the long sun ). 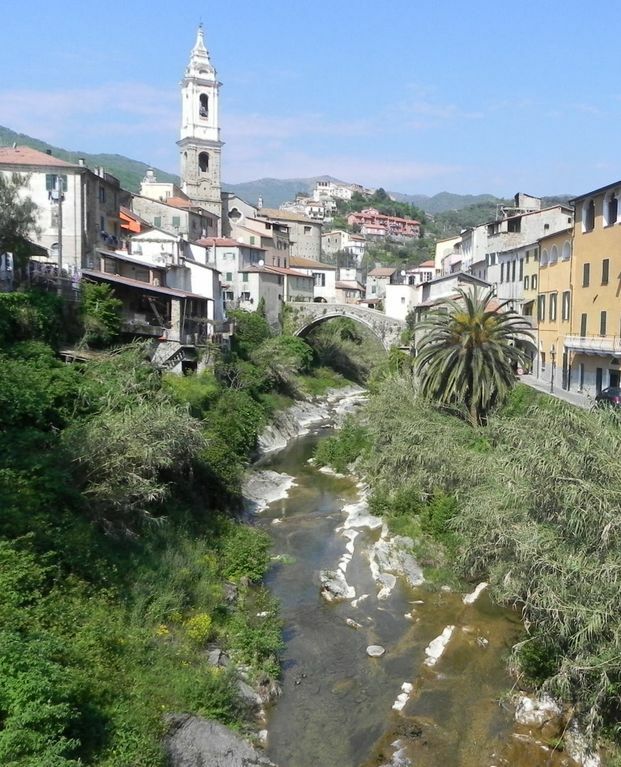 Mass tourism does not disturb the narrow alleys of this ancient olive village amidst the Ligurian hills. Isolalunga 200 m above sea level was built in the Middle Age as a typical defence-village against the Saracen pirates. In 2004 inside completely renovated, the house offers comfort in two residential units for 6 to 10 people. From the second floor ( Living room, connected with a large kitchen, together about 45 square metres) and the rooftop terrace you enjoy a beautiful view of the valley and the 5 km distant Mediterranean Sea. In 5 minutes by foot you reach the Middle Age Village Dolcedo with excellent restaurants , a big riding school , typical shops and cultural events. Ligurian “ Dolce Vita” on the “Piazza”. Casa Fontana is also an ideal starting point for walking tours with breathtaking views on the see and the mountains. The 'Riviera of Flowers' with famous cities and beaches offers something for young and old. The aquarium and maritime museum in Genova, the exotic Hanbury Gardens near the french border, golf in San Remo, museums, Caves of Toirano, water parks, the artist village Busanna Vecchia, markets, Film festival in Cannes, firework world championships in San Remo, whalewatching in Imperia, boat trips, San Remo music festival, Casinos in Monaco/Monte Carlo and San Remo, dancing in Ligurian villages and discos and many cultural events in the surrounding ancient mountain villages. Charming and spacious antique village house in sunny Isolalunga This charming village house, detached on three sides, convinces with its quiet location, its beautiful sea and valley-views and its well-kept condition. It has been completely renovated in 2008 and combines comfort with antique details. Ideal for walking or biking tours with breathtaking views on the sea and mountains. Casa Fontana is a rustical ligurian stone house on three floors with a rooftop terrace. Small plazas and a winding alley leading to the house provide a safe and fun place for children to play (parking spaces are located 100-250 M from the house). The walls of the house are 500 years old but the interior was completely renovated in 2002. Arched entryways, fluted ceilings ,fireplaces, iron windows, 2 baths, kitchen and a guest bath combine historical flair and modern comfort. The two separate apartments can be connected by a staircase into one big unit. The small apartment is furnished for three persons: one living/sleeping room, kitchenette and bathroom with shower and toilet. The bigger apartment on the first and second floor has two sleeping rooms with 5 beds, a bathroom, a second separate WC and a large kitchen/living room with sofa bed. The kitchen/living room is furnished for 10 people, from here you reach the rooftop terrace by a spiral staircase. Internet access on demand. Wow was our first impression. We went with two families of 4 (4 adults and 4 kids). We were met by Marco who welcomed us and was extremely helpful. The house was very well equipped and comfortable with plenty of space. It had a quirky and very authentic feel to it and felt like at home more or less straight away. There were very few tourists and the local people were extremely warm and friendly and actually invited us all to their bi annual meal and drinks at the local chapel courtyard. The village of Dolcedo is felt like we were in a fairy tale with awesome view and real authenticity. Plenty to see and visit in the area and only an hour's drive Monaco. A car is essential and parking was difficult but happy to live with this. We would definitely recommend booking this place. Enjoy!!!! We had a great time at Casa Fontana in Dolcedo/Isalolunga. It's a beautiful big house, with a great roof terrace, where you can see the whole area and towards the sea. Dolcedo is a lovely small town with cosy restaurants and a beautiful Church. Imperia is also a nice town 6 km away with great beaches. Sometimes difficult to find a parking lot, but you get used to it. You can also easily take the bus 500 meters from the house towards the town. THANK YOU! We'll be back! Thanks to our Norwegian guests, we look forward to your next visit. Takket være våre norske gjester, ser vi frem til ditt neste besøk. This is a great property! The house was wonderful...full of character and very comfortable. The old village of Dolcedo is a perfect place to begin exploring the region. We were able to relax as well as set out on daily adventures. The owners were especially helpful in making sure we were ready for our vacation. The house was exactly as advertised and more. Highly recommend this for anyone looking to get away to some peace and quiet, or have a great staging place to explore the Italian and French Riviera's. It's a great house with lots of room and a beautifull furnished kitchen. The roofterras is the best! And you can eat all you want if you walk to the little shop every day to buy panini's. I would have to rate my time in this apartment as a 5 for excellent. Right from the beginning, upon requesting information, I immediately contacted and was very happy with the way Herr Bormann answered my questions and showed an interest in the needs of me and my family. The care taker of the vacation home was also very friendly and answered all of our questions, even recommending great restaurants in the area. We were, however, surprised at the drive up to the vacation home. Very steep, windy, and steep. But, it was worth it! The view from the top floor balcony is splendid. We ate breakfast there every morning. Dolcedo is in itself, in my opinion, the most beautiful village in the valley. We made a driving loop up the valley and down the other visiting the many small villages and admiring the breathtaking view of the mountains and the sea. Our favorite was Valloria, where the doors are painted by artists and where one can get lost roaming on the windy, narrow pathways through the town. It was a great experience and I would definately recommend this vacation home and it's surroundings to anyone looking for a peaceful, romantic, and memorable holiday. The last part of the way to Isolalunga is relatively steep for 500m/550yd, but that s normal for Italien mountain villages.However there will be an new , more comfortable road from autumn 08. A Wonderful Holiday at Casa Fontana! We spent 1 week at Casa Fontana in Dolcedo and had a wonderful time! The house is very spacious and incredibly comfortable. The property was very clean and well maintained...the house-keeper even had a fire in the firepace going when we arrived in case we were chilly.We were there with 2 couples and had so much room and privacy, but there is also room for 3 or 4 couples or a large family comfortably. The house has 2 lovely fireplaces and the bathrooms were beautiful...3 bathrooms in the house and 2 showers.The terrace was private and we enjoyed the fantastic views and the sunshine. There is so much to do in the immediate area, and we recommend a visit any time. Our experience with this house rental and the owners was perfect for us and we were thrilled......it surpassed all of our expectations.........we had a terrific holiday!!!! P.S. The village of Valloria is a place we visited during our week...it is an AMAZING village up in the mountains...only a 15 minute drive from the house.....the town is magical...every door has been painted by a known artist and it is quite a spectacular adventure to seek them all out...also...we ate what we all agreed was the absolute best meal of our lives at a tiny local restaurant in Valloria called "La Porta Dei Sapori". A MUST if you are visiting the area.